There is nothing like the Le Mans 24 Hours. The world’s greatest race has always been more than the pure pursuit of speed. Le Mans is the ultimate test of ideas, innovations, endurance, creativity and beauty. Innovative historical examples of race cars include: the enclosed, aerodynamic bodywork of the 1925 Chenard and Walcker Z1 “tank”, the 1963 Rover BRM kerosene powered turbine car and the 1991 race winning Mazda 787B rotary. In recent years, Le Mans organizers have pushed for significant reductions in fuel, energy and tire usage. The open formulas available to achieve those results have made Le Mans the most relevant and exciting form of competition for manufacturers worldwide. This approach has inspired the creation of Audi’s diesel and diesel hybrid technologies, Toyota’s ultra-capacitor hybrid, Porsche’s V4 hybrid and Nissan’s radical DeltaWing and GTR-LM concepts. Over the past 93 years, Aston Martin, Audi, Bentley, BMW, Chevrolet, Dodge, Ferrari, Ford, Honda, Jaguar, Maserati, Mazda, McLaren, Mercedes-Benz, Nissan, Peugeot, Porsche, Renault, Toyota, and others have used the Le Mans 24 Hours to build international awareness. Each era’s winning cars have reflected the brand ambitions of the competing companies and represented a breakthrough in technology. 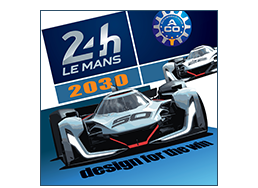 The Michelin Challenge Design 2017 – Le Mans 2030: Design for the Win – invites you to create a breakthrough race car to win the Le Mans 24 Hours in the year 2030. 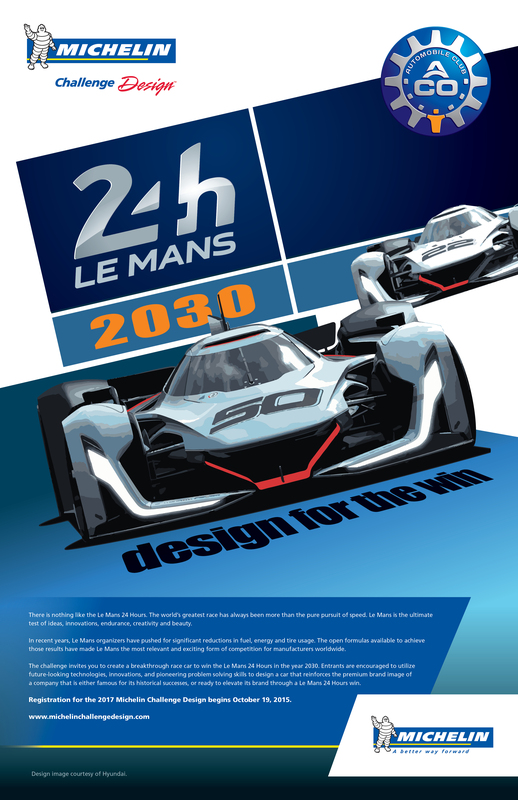 Entrants are encouraged to utilize future-looking technologies, innovations, and pioneering problem solving skills to design a car that reinforces the premium brand image of a company that is either famous for its historical successes, or ready to elevate its brand through a Le Mans 24 Hours win. Michelin Challenge Design is open to residents of any country. Parents or legal guardians of entrants less than the age of majority in their state, province or country must sign the MCD Questionnaire and the MCD Entry Form. Michelin Challenge Design is void where prohibited by law. All entries for the Michelin Challenge Design must be received by August 1 of the previous year. Employees of Michelin, its parent, affiliates, subsidiaries, officers, directors, distributors, suppliers, agents, representatives, advertising, promotional or judging agencies, authorized Michelin tire dealers and distributors, and their immediate family members and those living in the same household, or anyone working on this project, are not eligible to participate. By participating you agree to be bound by the Rules and Procedures of this challenge and by the decisions of the Michelin Challenge Design Jury and of Michelin, whose decisions shall be final and binding in all respects. Any entries or displays may be withdrawn or declined for any reason at any time. Entrants must include all data and information and fulfill all requirements as required by the Michelin Challenge Design Rules and Procedures and Entry Form in order for the entry to be valid. Entrants must provide all data and information that is accurate and complete. If more than one person designed an entry, all designer names must appear on the “Designer(s) Name(s)” portion of the Michelin Challenge Design Entry Form. Student designers who are working with an engineering department, at a university, are required to take the lead role in the development of any submitted work. This means that the designer has final say to all technical questions that will have an impact on the functional and aesthetic result of the design work. Completed entries will be accepted via Mail, Fax or Internet. For Internet entries, visit //www.michelinchallengedesign.com and complete and submit the online Michelin Challenge Design Entry Form with all accompanying required materials. Entry forms must be accompanied by photographs, drawings and/or computer-generated images. Incomplete entry forms are subject to disqualification. All Entry Forms must be received by Michelin or its designee on or before August 1, 2016. Final evaluation will take place in August 2016, and those chosen to display will be notified shortly thereafter. Decisions of the Michelin Challenge Design Jury and Michelin are final. Michelin and/or its authorized agents retain the right to verify the identity of, eligibility of, and accuracy of information supplied by all individuals or groups who have entered Michelin Challenge Design. Please note the dates above are subject to change. Michelin will directly notify those chosen to display properties for the Michelin Challenge Design. The names of those chosen to display will be posted online at: www.michelinchallengedesign.com. Conditions of participation: Those chosen to display will be required to sign and return an Affidavit of Eligibility, a Liability Release, and, where legal, a Publicity Release within 14 days of notification. For those chosen to display who are less than the age of majority in their state, province or country, the affidavit and release(s) must be signed by the participant’s parent or legal guardian. In the event of non-compliance with these requirements, the chosen entry will be disqualified and an alternate will be chosen at Michelin’s discretion. All chosen entries will be recognized on www.michelinchallengedesign.com. Submissions remain the property of the entrants; however, by entering, all entrants agree to permit Michelin to use their entries, names or likeness, for Michelin advertising/marketing materials in perpetuity and for any and all purposes including but not limited to reproduction, distribution, and public display of any such entry, name or likeness. Entrants also agree that Michelin may use of their names and likenesses for purposes of advertising, trade show use and promotion without additional compensation, unless prohibited by law. By entering, participants release and hold harmless Michelin, its parents, subsidiaries, affiliates, directors, officers, employees and agents from any and all liability or injuries, loss or damage of any kind arising from or in connection with participation in this challenge or acceptance or use in any prize. No responsibility or liability is assumed by Sponsor, its affiliates, subsidiaries, agents or representatives, or anyone working on this project: for lost, late, misdirected, illegible, or mutilated entries or any other such events that may occur; or for technical, hardware or software failure of any kind, for lost network connection or for garbled computer transmissions. If for any reason, programs are not capable of running as planned, including infection by computer virus, bugs, tampering, and unauthorized intervention, fraud, technical failures, or any other causes beyond the control of Sponsor which corrupt or affect administration, security, fairness, integrity, or discretion, Sponsor reserves the right to cancel, terminate, modify or suspend the Promotion. Sponsor assumes no responsibility for any error, omission, interruption, deletion, defect, delay in operation or transmission, communications line failure, theft or destruction or unauthorized access to, alteration of entries. Sponsor is not responsible for any problems or technical malfunction of any telephone network or lines, computer on-line systems, servers, computer equipment, software, failure of any e-mail to be received by Sponsor on account of technical problems, human error or traffic congestion on the Internet or any Web site, or any combination thereof, including any injury or damage to the participant’s or any other person’s computer related to or resulting from participation or downloading any materials in this promotion. If for any reason your submission cannot be viewed or is not capable of running as planned, including infection by computer viruses, bugs, tampering, unauthorized intervention, fraud or technical failures, Sponsor assumes no responsibility. Sponsor is not responsible for any problems or technical malfunctions. Michelin Challenge Design is governed by the laws of the United States. Roundtrip coach airfare to Detroit to attend 2017 North American International Auto Show (NAIAS-Detroit) for the sole designer or, in the case of a team design, one team representative. Michelin will book the airfare on your behalf; any guests will be at your expense. Travel Visa: If required and you provide Michelin with your receipt, Michelin will reimburse you the expense. This does not apply to passport fees. Daily per diem of $50.00 USD/day* (maximum of $250.00 USD) for meals and miscellaneous expenses, available for you at check in to your hotel in the form of a VISA® gift card. Invitation to attend and recognition at the private Michelin Designer’s Reception, Monday, January 9 – highlighted by the exposure to NAIAS, media, designers and other winners. Michelin Challenge Design may also recognize a select number of entries for Honorable Mention which will be publicized on the Michelin Challenge Design and Car Design News web sites. In addition, the 2017 Michelin Challenge Design First Place winner will be recognized at the 2017 Le Mans 24 Hours race. Additional details to be announced. Michelin North America, Inc., of One Parkway South, Greenville, South Carolina 29615, is the Sponsor of the Michelin Challenge Design. Publication: After the challenge has concluded, those chosen to display will be published on www.michelinchallengedesign.com. A list of those chosen to display may also be obtained by sending a self-addressed stamped envelope to Michelin Challenge Design, c/o Event Management Corp., 3150 Livernois, Suite # 175, Troy, MI 48083, to be received by February 1, 2017.